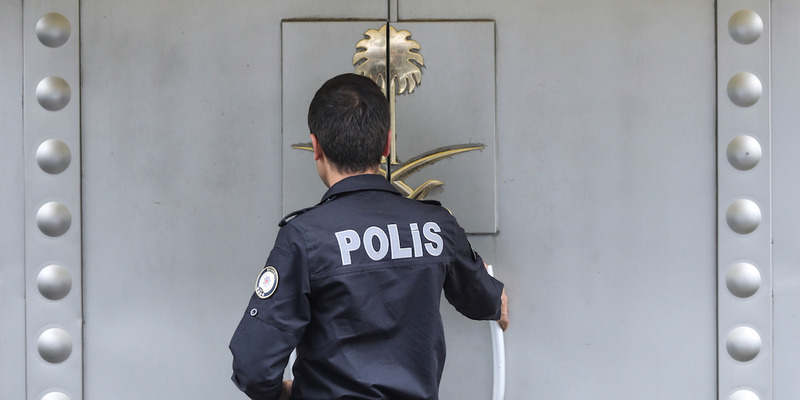 GettyTurkish police have reportedly been given permission to search a well in the Saudi consulate in Istanbul. Here, a Turkish police officer enters the Saudi consulate in Istanbul on October 12. A Turkish politician claimed on Monday that journalist Jamal Khashoggi’s body was dumped in a well on the grounds of the the Saudi consulate in Istanbul. It wasn’t clear where Doğu Perinçek got that information, and the Turkish president did not address it in a speech on Tuesday. Turkish police have been given permission to search a well in the Saudi consulate in Istanbul, where rumours have claimed Jamal Khashoggi’s body was hidden, Turkish state-run TV reported on Wednesday. The search comes as part of Turkey’s investigation into Khashoggi’s whereabouts, Turkey’s NTV channel reported, as cited by Reuters. The reported search of the comes two days after Doğu Perinçek, the chairman of Turkey’s left-wing nationalist Patriotic Party, claimed that parts of Khashoggi’s body had been found in a well in the the consulate. It was unclear where Perinçek got that information, or whether he was privy to Turkey’s intelligence, which has been the source of most of the details of what happened (much of which is unconfirmed). NTV’s report that the Saudis had allowed the search came around an hour later. Turkish police have searched the Saudi consulate and consul-general’s home before. It’s not clear whether they were given access to the well during earlier searches. Erdogan appeared to ignore those rumours in his speech. He instead settled for alluding to Saudi claims, made anonymously to Reuters and the Associated Press, that Khashoggi’s body was rolled up in a fabric and handed over to a local Turkish collaborator for disposal. Although Khashoggi’s killing took place in Istanbul, Turkish officials have had to adhere to Saudi rules because the consulate is diplomatic Saudi property. Turkish authorities weren’t allowed to search the Saudi consulate until two weeks after Khashoggi’s October 2 disappearance. Footage caught cleaning crews moving boxes of cleaning supplies into the building before Turkey was allowed to send in its investigator. Turkey has challenged the Saudi narrative on Khashoggi’s death at every turn, and experts say it is likely because it is trying to extract some kind of concession from the kingdom. Lisel Hintz, an associate professor at Johns Hopkins University, added that Turkey’s state-run newspapers that have been covering the crisis tend to print whatever the government wants them to. Turkey’s president contradicted that claim on Tuesday, saying instead that Khashoggi’s death was the result of a preplanned murder.